Scandal has ERUPTED in the NBA after Rockets center Dwight Howard was caught using Stickum spray to make his hands all sticky and stuff last night. In the first quarter of yesterday’s loss to the Atlanta Hawks, Paul Millsap was shooting free throws when he got the ball and made this face. Referees stopped the game, tossed the ball out, Rockets coach J.B. Bickerstaff moved something from the scorer’s table back to the Rockets bench, and the game resumed after a warning. Here, watch it. After the game, the Atlanta Journal-Constitution confirmed that Millsap rejected the game ball immediately after Howard sprayed his hands and checked in. They caught up with Millsap and he told them how disconcerting it felt. 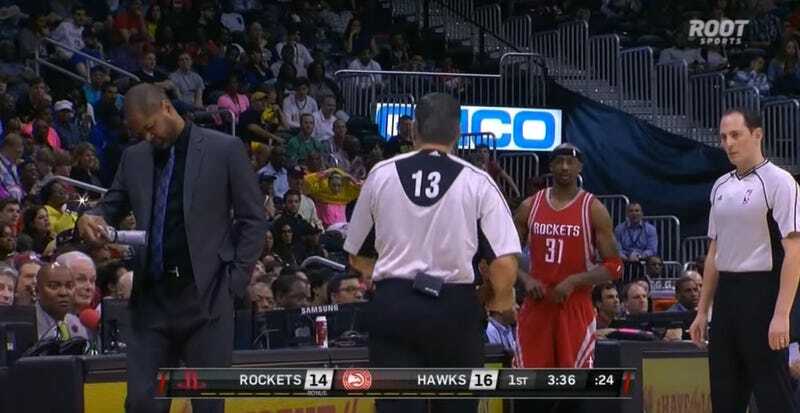 If you’re Dwight Howard in this situation, what’s the worst way to handle this? Damnit Dwight. The NBA is reportedly going to investigate the matter, and a good place to start and end that investigation might be with the above comment.